The Baltimore Album Quilt patterns include blocks from 4 of Lovely Lane United Methodist Church Museum's quilt collection. The design group who traced the patterns selected the best blocks from these 4 quilts so a balanced, 25 block quilt could be made. The patterns were traced full size, and include all of the imperfections in the original quilts. The fabrics in the Reverend Best quilt have faded to brown except for the reds and pinks. 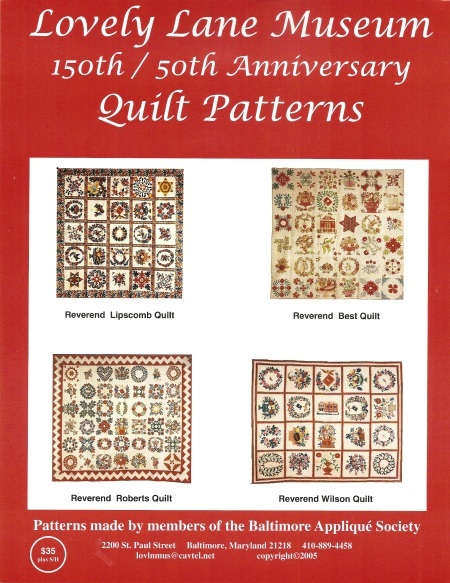 These patterns were taken into the 21st century by providing a CD-ROM that contains pictures of each of the 25 blocks as well as a picture of each of the original quilts. The pictures can be viewed by computer, DVD players (with jpg file capability), or taken to a store that develops prints from CD-ROMs. Click on one of the four quilts to see a better image!